Home Secretary David Blunkett has asked the head of the Prison Service to explain why a burglar shot by farmer Tony Martin was released early. Brendan Fearon was freed from jail on Friday less than a third of the way through an 18-month sentence for heroin dealing. 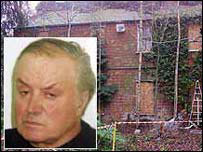 He was wounded in the legs while burgling Martin's remote farmhouse in Norfolk in August 1999. His accomplice, 16-year-old Fred Barras, died of his gunshot injuries. Home Office Minister Paul Goggins said he had no reason to believe Fearon's case had been handled improperly but that Mr Blunkett wanted a detailed report from Prison Service boss Phil Wheatley by Monday. Tony Martin - who has served two-thirds of his five-year sentence for manslaughter - has been moved from Highpoint Prison in Suffolk to a secret location pending his expected release on Monday. Police have established a mobile police station outside his farmhouse. It is thought officers will staff the unit 24 hours a day for several weeks to ensure his safety. A friend, Malcolm Starr, spoke to Martin on Saturday night. Mr Starr said Martin had described Fearon's release as "an insult to decent people". "He [Martin] seems fine and seems reasonably normal," said Mr Starr. Earlier Mr Starr said the police were taking threats Martin had received "very seriously". "The only person not, perhaps, taking them too seriously, is Mr Martin. "He feels if you are having to look over your shoulder for the rest of your life, you might as well be in prison, or be dead anyway." The home secretary is understood to want more details on the Fearon case. Mr Goggins said: "In view of the high profile nature of this case and some allegations made in the media, I will be asking the head of the Prison Service to report to the home secretary on Monday on the detailed circumstances." Conservative MP Henry Bellingham criticised Fearon's early release - under the terms of the government's tagging scheme - and said Martin was being treated unfairly. He told BBC Radio 4's Today programme: "There are people in the Home Office who deeply resent the fact Tony Martin has attracted so much publicity. "They resent the fact that he is going to come out of prison and wage various campaigns, not least to get the legal aid rules changed and to have a debate about the law surrounding householders' rights. "I just can't believe this is just a coincidence. There are people in the Home Office, there are people in the prison service who just want to put the boot into Tony Martin. That's what Tony Martin feels." Fred Barras's uncle, Tony Joynes, said in the same interview: "You cannot say we are pleased with what Martin did, but there is no anger as such, like the reports you read in the paper, about taking revenge and all that. "That is a load of rubbish." Several newspapers have also criticised the timing of Fearon's release so soon before Martin is let out. Fearon was jailed for three years for conspiracy to burgle Martin's home. 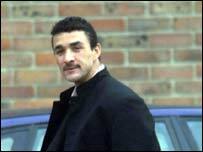 Martin was jailed for life after being found guilty of murder, but the conviction was reduced to manslaughter and the sentence to five years by the Court of Appeal in October 2001. The 56-year-old farmer has vowed to return to his home in Emneth Hungate and added security measures are being installed in time for his return. Martin's friends believe he is being held in a police station in East Anglia prior to his release, and plans to renovate his now increasingly derelict farmhouse. "There's a mobile police station outside Tony Martin's house"